Free online Sierpinski square fractal generator. Just press a button and you'll get a Sierpinski square curve. There are no ads, popups or nonsense, just an awesome Sierpinski square generator. Press a button – get a Sierpinski square. Created by mathematicians for mathematicians. We just created another project – DEVURLS – world's simplest developer news aggragator. Check it out! A link to this tool, including input, options and all chained tools. This tool cannot be chained. Rhombus Form Draw the regular Sierpinski square fractal. Square Form Draw the space-filling Sierpinski square fractal. Padding Offset in px from canvas margin. Line Width Sierpinski square's line width. Background Sierpinski square's background color. Line color Sierpinski square's line color. Internal color Sierpinski square's inner color. Sierpinski square generator tool What is a sierpinski square generator? This tool draws Sierpinski square fractals. 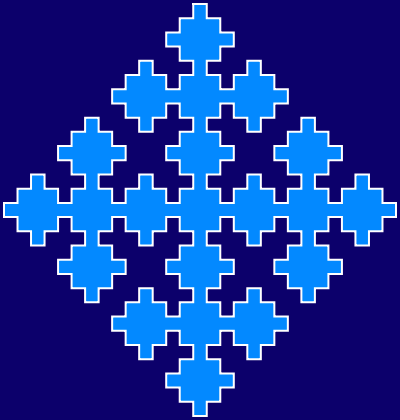 A Sierpinski square fractal is similar to the Sierpinski curve. The only difference is that the Sierpinski square grows from the sides of the starting square but the Sierpinski curve grows from the corners. There are two types of Sierpinski square – the rhombus form and the square form. You can adjust the size (width and height) of the Sierpinski fractal and padding from the sides of the square. You can also set the curve's thickness, its color and curve's fill color as well as the background color. Mathabulous! This example generates a regular (rhombus form) Sierpinski square fractal. We use 4 iteration steps and a rectangular canvas of 400 by 420 pixels. We add extra space of 3px around the fractal from all sides and choose line width of 2 pixels. These options will be used automatically if you select this example. In this example, we use a square shape form for the fractal. 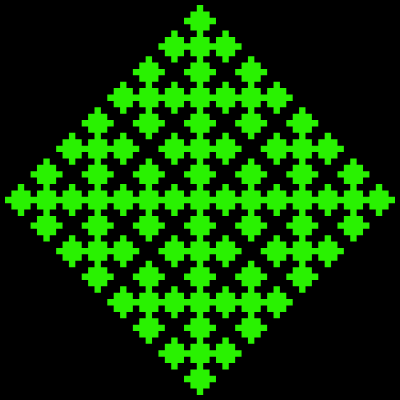 In this case, the regular Sierpinski square is turned over by 45 degrees and it becomes a space-filling curve. 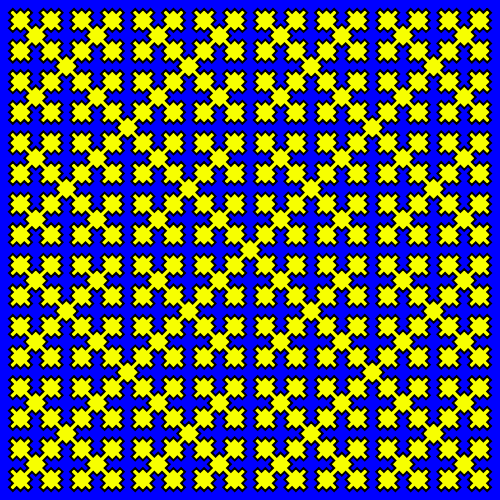 This example draws the fractal of size 500x500px for 6 generations and uses a yellow-blue-white color theme. This example draws a rhombus-shaped fractal without the contour line around the fractal. As a result only two colors are used – green fill color and black background color. The rhombus is inscribed in a 400-by-400 square canvas and is offset by 5 pixels from the edges. You can pass options to this tool using their codes as query arguments and it will automatically compute output. To get the code of an option, just hover over its icon. Here's how to type it in your browser's address bar. Click to try! Quickly visualize rules of an Lindenmayer rewrite system. Quickly generate a list of primes. Quickly generate a list of Fibonacci numbers. Quickly generate a list of extended, negative Fibonacci numbers. Quickly generate a list of Fibonacci primes. Quickly generate a list of Fibonacci words. Quickly generate a list of Tribonacci words. Quickly generate a list of Lucas numbers. Quickly generate a list of extended, negative Lucas numbers. Quickly generate a list of Lucas numbers that are also prime numbers. Quickly create a list of excessive numbers. Quickly create a list of deficient numbers. Quickly generate a list of perfect numbers. Quickly create a list of slightly defective numbers. Quickly generate a list of look-and-say sequence numbers. Quickly create a list of Prouhet-Thue-Morse sequence values. Quickly create a list of dragon curve sequence values. Quickly create a list of Oldenburger-Kolakoski sequence values. Quickly create a list of Gijswijt sequence values. Quickly create a list of Golay-Rudin-Shapiro sequence values. Quickly create a list of Baum-Sweet sequence values. Quickly create a list of Moser-de Bruijn sequence values. Quickly generate a list of even numbers. Quickly generate a list of odd numbers. Quickly find all factors of the given integer. Quickly decompose integers into their prime factors. Quickly find out if the given integer is a prime number. Quickly generate π constant's digits to arbitrary precision. Quickly calculate Euler constant's digits to arbitrary precision. Quickly calculate φ constant's digits to arbitrary precision. Quickly create a triangluar array of binomial coefficients. Quickly create a matrix with random elements. Quickly create a unit matrix with ones along the diagonal. Quickly find the transpose of a matrix. Quickly find the inverse of a matrix. Quickly calculate the determinant of a matrix. Quickly find the sum of two or more matrices. Find the difference of two or more matrices. Quickly find the product of matrices. Quickly draw a Hilbert space-filling curve. Quickly draw a Heighway triangle fractal. Quickly draw a Harter-Heighway space-filling dragon fractal. Quickly draw a Davis-Knuth dragon fractal. Quickly draw a triple dragon fractal. Quickly draw a quaddragon fractal. Quickly draw a hexdragon curve. Quickly draw a Peano space-filling fractal. Quickly draw a Moore space-filling curve. Quickly draw a Peano-Gosper space-filling curve. Quickly draw a Sierpinski arrowhead fractal curve. Quickly draw a Sierpinski sieve fractal. Quickly draw a Sierpinski closed plane fractal curve. Quickly draw a Sierpinski carpet fractal. Quickly draw a Sierpinski maze fractal. Quickly draw a Sierpinski square fractal. Quickly draw a Sierpinski pentaflake fractal. Quickly draw a Sierpinski hexaflake fractal. Quickly draw a Sierpinski n-gon fractal. Quickly draw a Koch island fractal curve. Quickly draw a Koch antisnowflake fractal. Quickly draw a Koch triangle fractal. Quickly draw a Koch n-gon fractal. Quickly draw a quadratic Koch flake fractal. Quickly draw a Cesaro fractal. Quickly draw a Cesaro n-gon fractal. Quickly draw a triflake fractal. Quickly draw a quadric cross fractal. Quickly draw a self-similar Levy C fractal curve. Quickly draw a Vicsek snowflake fractal. Quickly draw a T-square fractal. Quickly draw a Cantor set fractal. Quickly draw an asymmetric Cantor set fractal. Quickly draw a generalized Cantor set fractal. Quickly draw an ε-Cantor set fractal. Quickly draw a Cantor dust fractal. Quickly draw a Pythagoras tree fractal. Quickly draw a Fibonacci word fractal. Quickly draw an H-tree fractal. Quickly draw a V-tree fractal. Quickly generate a Morton Z-order fractal curve. Calculate the n-th digit of Euler's number. Calculate the n-th digit of Golden Ratio. Calculate the n-th digit of pi constant. Perform the inverse operation on a look-and-say sequence. Create a list of Bell numbers. Create a list of Charmichel numbers. Create a list of Catalan numbers. Create a list of composite numbers. Create a list of secant numbers. Create a list of Golomb-Silverman numbers. Create a list of Euler's phi numbers. Create a list of juggler numbers. Create a list of lucky numbers. Create a list of motzkin numbers. Create a list of Padovan numbers. Create a list of semiperfect numbers. Create a list of Ulam numbers. Create a list of weird numbers. Create a list of superperfect numbers. Find all partitions of the given integer. Create a list of Partition function numbers. Create an arithmetic sequence of numbers. Create a geometric sequence of numbers. Create a list of natural numbers. Create a list of numbers of powers of two. Create a list of numbers of powers of ten. Multiply all matrix elements by a number. Determine if a matrix is degenerate. Given a matrix, find its cofactor matrix. Given a matrix, find its adjunct. Decompose a matrix into LU factors. Find eigenvalues of a matrix. Beautify a matrix by neatly aligning all its columns. Convert matrix in one format to another format. Generate a Fibonacci spiral curve. Generate a drawing of Fibonacci rectangles. Generate a Fibonacci flower head. Generate a Padovan equiliteral triangles fractal. Generate an Apollonian gasket fractal. Generate a Minkowski Question-mark fractal. Generate a Thomae's function (also known as popcorn or raindrop function). Convert numbers as English text to actual digits. Convert numbers to written English text. Convert numbers written in decimal form to scientific form. Convert numbers written in scientific form to decimal form. Apply ceil operation to numbers. Apply floor operation to numbers. We're Browserling — a friendly and fun cross-browser testing company powered by alien technology. At Browserling we love to make developers' lives easier, so we created this collection of online math tools. Unlike many other tools, we made our tools free, without ads, and with the simplest possible user interface. Our online math tools are actually powered by our programming tools that we created over the last couple of years. Check them out! If you love our tools, then we love you, too! Use coupon code MATHLING to get a discount at Browserling. By using Online Math Tools you agree to our Terms of Service. TLDR: You don't need an account to use our tools. All tools are free of charge and you can use them as much as you want. You can't do illegal or shady things with our tools. We may block your access to tools, if we find out you're doing something bad. We're not liable for your actions and we offer no warranty. We may revise our terms at any time.